Machines Are More Versatile: Are You Up To Speed? How well do you know the capabilities of your vending machines? As electronics, LED lighting and other innovations have enabled more features, many of today’s standard models can allow a vending operator to meet customer needs that they might not have thought of. 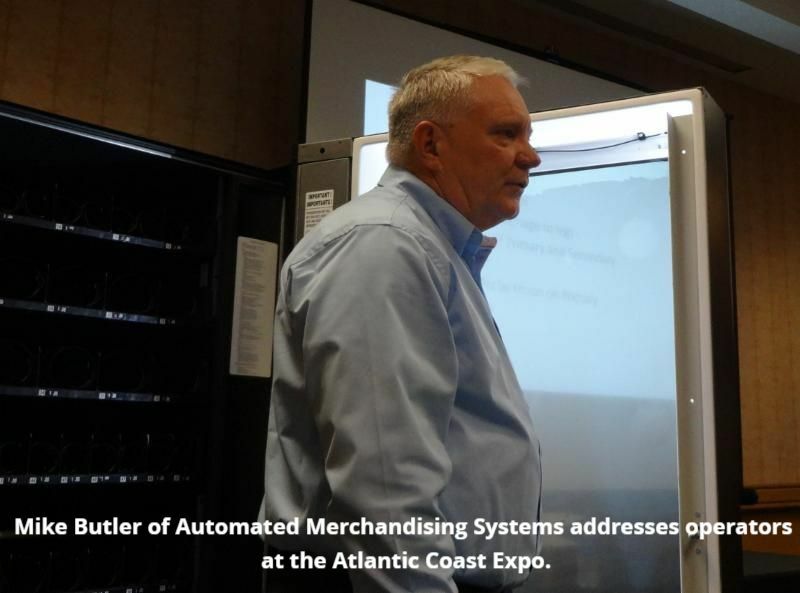 Mike Butler, northeast regional sales manager for Automated Merchandising Systems, provided an overview of the company’s glassfront Sensit machines during the Atlantic Coast Expo in Myrtle Beach, S.C. The presentation was part of the ACE Training School, sponsored by Southeastern Vending Services. Operators may not know they can disable the health and safety feature in an AMS Sensit food machine if the machine is not selling perishable products. As most operators know, the health and safety feature prevents the sale of compromised perishable items due to the interior of the food machine exceeding 41 degrees F. In the event of a power interruption to the machine, the health and safety feature will disable the vender if the internal temperature has risen above 41 degrees (according to the NAMA specification) for a period greater than 15 minutes. This ensures no perishable items that were compromised during this period are sold once the power returns and the machine is operable once again. In the event that no perishables are being sold through the machine, the AMS temperature can simply be programmed to 42 degrees and the health and safety will be disabled. It is also possible to assign health and safety on an item by item basis. “If you have one or two (perishable) items available in the machine, you can assign health and safety just for them,” Butler said. Another feature, “hide card value,” can reduce the chance that a customer will be alarmed when they see the highest authorized price displayed on the machine’s credit card reader. Customers sometimes think they will be charged the highest authorized value when they see it on the card reader. The reader can be programmed to not display the highest authorized value. In addition, AMS’s “Energy Sensit” feature can reduce the amount of power the machine uses during inactive times. “It’s a great way to save energy and a nice sales tool when you’re going into a location,” Butler said. While many companies are monitoring machine data remotely nowadays, Butler reminded his listeners that they can always check the temperature on the Sensit machine’s keypad, as well as the amount of time the refrigeration has run over the past three hours. Once the door has opened, they can also check sales data without asking a route person to enter the programming code. Butler reviewed the features of the Sensit guaranteed delivery mechanism. A series of LED beams flash across the delivery bin to ensure that a product was dispensed following a purchase from the machine. If the beams fail to detect the vend, the digital screen offers the customer the option of making another selection or getting a refund. The Sensit 3 glassfront machine, unlike the older Sensit 1 and Sensit 2 machines, has home switches on each motor, Butler said. Older S1 and S2 motors can be used in newer S3 models, he said, but the tray on which the older motors are used must be set to “SENSIT” in the programming. At that point, the delivery system will operate using the guaranteed delivery sensors only. Butler also reviewed maintenance practices that can extend a machine’s life. He pointed out that there is a hinged door on the front of the refrigeration cover. Once open, there is a removable screen that needs to be removed and cleaned approximately once a month. “To ensure maximum compressor life, it is imperative that you keep this screen clean,” he said. Tray dividers are easy to clean since dividers pop out and snap back in easily, he said. Dividers in bottle dispensing trays, which are riveted for added tray integrity, are not removable without the use of tools. It is also advisable to keep machines at least six inches away from walls to ensure correct air flow through the refrigeration system. Butler acknowledged that this is often difficult to do, but it is imperative in order to maximize the life of the cooling system.